If we will ever achieve Paul Ehrlich’s "magic bullet," that is, a molecule which goes with high selectivity to the therapeutic target site, does what it needs to do, and is subsequently cleared from the body, the practice of safety assessment will have to change. 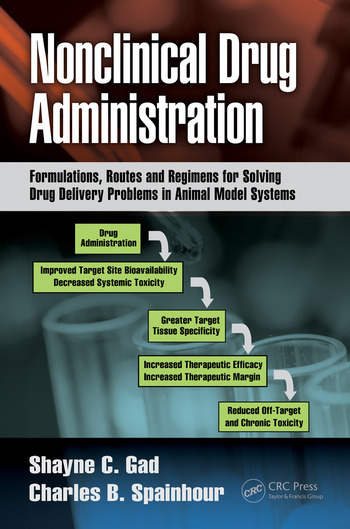 Nonclinical Drug Administration: Formulations, Routes and Regimens for Solving Drug Delivery Problems in Animal Model Systems seeks to address a trio of objectives that, though separate, are linked and central to biomedical science and, ultimately, medicine. Rather seeing these as separate "silos," those working in nonclinical safety assessment will have to view these three in an integrated manner and to regularly and thoughtfully incorporate new information and technology. The trio of objectives this book explores are: first, to present how to deliver more of a drug product systemically to facilitate the regulatory need for evaluating safety and efficacy in animal species (at elevated exposure levels) prior to advancing the drug to human testing; second is to achieve better tolerance to therapeutics administration in test animals and humans which achieves objectives 1 and 3; and third, to explore ways to improve on therapeutic target receptor delivery performance, therefore improving both clinical pharmacodynamics bioavailability and specificity. 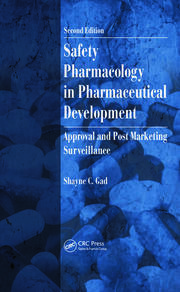 The book’s ten chapters assemble the basic concepts, principles and hypotheses involved in quantitative receptor and chronological organism interaction dynamics central to the successful development of new therapeutics which depend on systemic administration to achieve desired therapeutic goals and in so doing avoid outcomes which limit, marginalize, or preclude the therapeutic use of so many molecules. Shayne C. Gad, B.S. (Whittier College, Chemistry and Biology, 1971) and after active duty service in U.S. Navy, Ph.D. in Pharmacology/Toxicology (Texas, 1977) DABT, Principal of Gad Consulting Services, a twenty-four year old consulting >rm with nine employees and more than 500 clients worldwide in the pharmaceutical and medical device industries. Past President of the American College of Toxicology, the Roundtable of Toxicology Consultants and three of SOT’s specialty sections, and recipient of the American College of Toxicology Lifetime Contribution Award in 2008. Served on Council, Membership, Program, and Animals in Research committees for ACT, mul-tiple committees in SOT, and currently on the regulatory opinions commit-tee of the Society of Toxicologic Pathologists. Previously at CMIR Chemical Hygiene Fellowship, Allied Chemical, Searle, Becton Dickinson and Synergen. He has authored or edited 49 published books and more than 350 chapters, articles and abstracts in the >elds of toxicology, statistics, pharma-cology, drug and device development and safety assessment. He has more than 39 years of broad based experience in regulatory toxicology, drug and device development, statistics and risk assessment, and has speci>c exper-tise in neurotoxicology, in vitro methods, cardiovascular toxicology, inha-lation toxicology, immunotoxicology, risk assessment and genotoxicology. Grant reviewer for EPA, CAAT, NIH, and Canadian Health. He has direct involvement in the preparation of INDs (111 successfully to date), NDA, PLA, ANDA, 510(k), IDE, CTD, clinical data bases for phase 1 and 2 studies, and PMAs. Served as the COO of two pharmaceutical companies while a consultant. Charles B. Spainhour has amassed approximately forty-seven years of experience in the pharmaceutical industry. For his >rst >fteen years Dr. Spainhour worked at a company known then as Smith Kline & French Laboratories and now as GlaxoSmithKline Corp., where he held positions in both the research and the development segments of the drug development process. Speci>cally, on the research side Dr. Spainhour’s activities involved the areas of phosphodiesterase inhibition, anti-diuretic hormone agonism and antagonism, dopamine agonism and antagonism, neuroleptic bio-chemistry, anti- infective mechanisms and structure-activity- relationships. On the development, side Dr. Spainhour worked in pharmacokinetics & metabolism, radiosynthesis, process chemistry and drug safety evalua-tion. Speci>c areas of endeavor included H2-antagonists, leukotrienes, anti- infectives, anti-hypertensives, anti- hyperglycemic agents and anti-arrhythmics. Dr. Spainhour played a key role in the development of the >rst H2-antagonist, Cimetidine® and worked closely with Sir James Black. Dr. Spainhour has a great interest and copious amount of experience in the research and development of natural products. Dr. Spainhour has also worked as an independent consultant in the areas of safety assessment and forensic toxicology, held a position on the faculty at the veterinary school of Texas A&M University and worked as a Toxicologist in the CRO Industry previously for Pharmakon Research International, Chrysalis International, Phoenix International Life Sciences and MDS Pharma Services. Currently Dr. Spainhour serves as the Executive Vice-President and Chief Scienti>c Of>cer for Calvert Laboratories and Calvert Holdings and is the President and Chief Scienti>c Of>cer of Spainhour & Associates LLC. Dr. Spainhour holds a B.S. from Michigan State University in Biochemistry, a veterinary degree from the University of Pennsylvania and a Ph.D. from Texas A&M University (Developmental Toxicology), and is board certi>ed in forensic science, toxicology and forensic medicine.